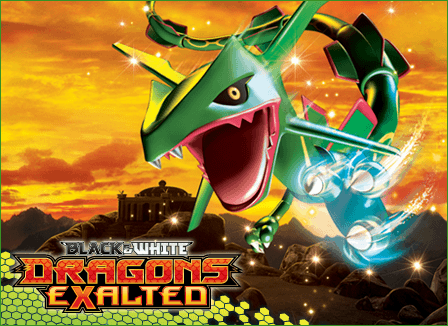 Special Event on Saturday Aug 18th….a Sealed Deck Dragon’s Exalted!! Open 6 packs of Dragons Exalted and make your best 40 card deck from (only) those cards plus basic energy. You bring your own energy or it will be available at a reduced rate of 5 energy for $1 (energy can only be purchased this way for use in the deck being constructed. Cost: $30 includes the 6 packs for the event plus 2 packs to go into the prize pool. Prizes and Rounds--Number of Rounds and Prize split to be determined by number of players. In a Sealed Deck event, players receive booster packs from the Tournament Organizer at the beginning of the event. Each player opens all of his or her booster packs at a signal from the Tournament Organizer and constructs a 40-card deck using only those cards and any basic Energy cards provided by the Tournament Organizer. Players have 30 minutes to construct their decks. tournament ends. The Tournament Organizer may require players to fill out deck lists, including the cards in their decks and any cards not being used. Once the first round of the tournament begins, players may not alter the contents of their decks. Booster packs used for a Sealed Deck tournament should come from the same set to preserve Evolution chains that may not exist outside of that set.